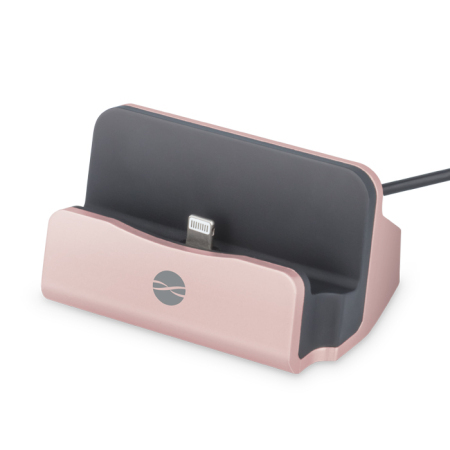 This small attractive dock in rose gold by Forever conveniently allows you to sync and charge your iPhone 8, iPhone 7S, iPhone 7, iPhone 6S, iPhone 6, iPhone 6 Plus, iPhone 6S Plus, iPhone SE and iPhone 5. The dock also has its own cable. great docking station,second unit I've bought,you can charge your phone with its cover still on.. Very happy with this docking station, only issue is that you have to remove your phone cover in order to charge it properly but it's ideal if you work at a desk most days in order to charge up your phone quickly. Would highly recommend this unit. This dock supports simultaneous syncing and charging of your iPhone via a lightning connector, so you can easily transfer files from your computer to your phone (and vice versa) whilst your handset is being charged at the same time. Simply connect the dock to a PC or laptop to begin charging and data synchronisation. As the iPhone 5 range shares the Lightning connector with latest iPhone 8, every iPhone since the iPhone 5 is compatible. So if you're looking for a sleek, smart and convenient way to dock and charge your iPhone then look no further. The Forever DS-01 Docking Station is small enough to fit on even the busiest desk. It has an elegant painted aluminium finish covering the whole dock, which will complement almost any design aesthetic. The dock features a large enough clearance so that you can place your phone in the dock with or without a slim case attached and it'll still provide your iPhone with a snug fit. This means that you won't have to sacrifice protection over function when using the dock.